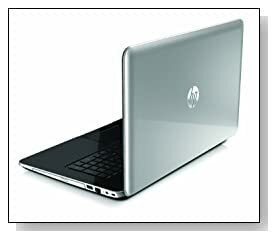 The new HP Pavilion 17-e040us laptop is filled with useful features, a few connectivity options, a large 17.3 inch diagonal HD screen and is well capable of performing well at most tasks at home or work without problems. Latest Haswell Intel Core i3-4000M at 2.4 GHz speed for great performance and energy efficiency, 6 GB DDR3L SDRAM 2 DIMM (Maximum supported 8GB) for smooth multitasking and a large 750 GB hard drive at 5400 RPM rotating speed with HP ProtectSmart hard drive protection to keep your data safe from accidents. 25GB cloud based Box storage is also included for lifetime. Operating system is the Windows 8 that can be upgraded to 8.1 for free on the Microsoft website. Big 17.3" diagonal HD+ BrightView LED-backlit display at 1600 x 900 pixel resolution and Intel HD 4600 Graphics as well as DTS Sound+ bring you great video and audio quality: Sharp texts, bright colors, lifelike images and full rich sound through large built-in speakers. It is fun playing games, watching movies, listening to music, surfing the net or chatting on Skype with friends and family on its HP TrueVision HD Webcam. 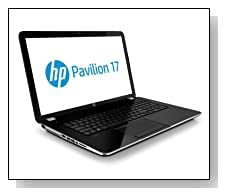 HP Imprint finish with the micro dot design in anodized silver HP Pavilion is 1.29 inch thick and weighs 6.4 lbs. It has a full-size keyboard with a 10-key numeric keypad to help you manage your budget and pay bills easily. And it comes with a 6-cell 47WHr lithium-ion battery that allows you to use your computer for just under 5 hours in a single charge. HP CoolSense function helps keep your laptop and keyboard cool for you to work on your daily tasks comfortably. For connectivity, you get 802.11b/g/n WLAN wireless, 1 x USB 2.0 Port, 2 x USB 3.0 Ports, Built-in SuperMulti CD/DVD burner, Built-in media card reader, an HDMI port to connect to even larger screens like HDTV, a VGA port (15-pin), 10/100BASE-T Ethernet LAN (RJ-45 connector), 1 Headphone-out/microphone-in combo jack and a Kensington MicroSaver lock slot. Verdict: HP Pavilion 17-e040us notebook is a step up from the previous HP Pavilion 17-e020us because of its 4th generation Haswell processor that is even faster and saves more on battery. It would have been nice if it had a touchscreen to use with the Win 8 operating system or a backlit keyboard to work comfortably in the dark but other than that it is a great laptop that is fast, powerful, reliable, easy to set up and use.